In UK supermarket price wars - has truth become the first casualty? WOW....I can hardly believe what I saw on TV last night. According to Panorama, an investigative programme from the BBC, all the UK's big 4 supermarkets are allegedly misleading their customers with pricing deals that don't add-up. From palpably incorrect signage promising 'Bigger packs - better value' to accusations of cynically raising prices to then reduce them in a blaze of publicity, supermarkets appear to be misleading their time-pressed customers during busy shopping expeditions - see this clip. Sophie Raworth one of the stars of BBC News TV and journalist on the Panorama programme admitted the maths were too difficult and on this clip said she needed a calculator .... conceding she couldn't do the necessary calculations when distracted by her 3 children out shopping. Mistakes or misleading - this is not what customers expect from their trusted retailers. Especially when these supermarkets talk about being on the customers' side! The tactics highlighted by Panorama are the sort of tactics so often used by retailers that don't 'get-it' ...don't understand the importance of trust in modern business. But for supermarkets like this to grub around in these murky waters is astonishing. We all knew price establishing went on, we all knew non-essential merchandise wasn't discounted as heavily as other high profile products (if at all) ...but to package things under 'bargain' banners when they are simply not better value has even surprised a practised retail observer such as me - and I feel embarrassed for trusting these retailers! Over the years, we've all forgiven these supermarkets for coming down hard on farmers in the name of passing low prices onto customers. We've all acknowledged the remarkable work supermarkets have done to reduce the percentage of household income spent on weekly food bills ...but trust me, this goodwill will soon be gone if these supermarkets don't clean up their acts, and super-fast. Thank you BBC and shame on theses supermarkets if they're found to be guilty, rather than incompetent. Golly Martin it’s a big Wow! I've always believed that the consumer protection laws did just that... protected us... and that the big boys adhered to them. Now I'll really have to watch closely (use a calculator) to see I'm not being gypped. And if it’s happening in the UK then it’s probably happening out here in Australia where we only have 2 big chains competing... fewer competitors to keep each of them honest. Every where in this world financial companies which are the part of market are having the price war like this blog, in UK supermarket price wars. Providing services to the middle class business is facing big trouble in price comparison. 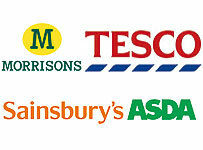 Thank you BBC and shame on theses supermarkets if they're found to be guilty, rather than incompetent.